FILE - Filmmaker George Lucas, left, and his wife, Mellody Hobson, listen to remarks at a news conference outside Los Angeles City Hall, June 27, 2017. Filmmaker George Lucas' Star Wars empire — the movie franchise, not Darth Vader's fictional galactic government — planted him firmly atop Forbes magazine's third annual ranking of the wealthiest U.S. celebrities which was released Tuesday. Most of Lucas' wealth came from the $4.05 billion sale of the LucasFilm production company to Walt Disney Co. in 2012, Forbes said. FILE - Steven Spielberg arrives at the 90th Academy Awards Nominees Luncheon at The Beverly Hilton hotel in Beverly Hills, California, Feb. 5, 2018. Fellow filmmaker Steven Spielberg, who turned 72 on Tuesday, came in second, with an estimated $3.7 billion net worth. 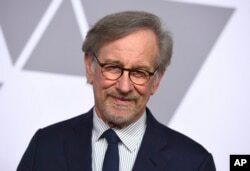 Spielberg's career as director, writer and producer spans some 50 years with credits that include Jaws, E.T., Raiders of the Lost Ark, Schindler's List and Saving Private Ryan. 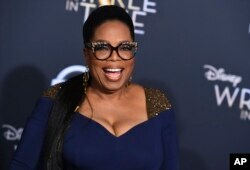 FILE - Oprah Winfrey arrives at the world premiere of "A Wrinkle in Time" at the El Capitan Theatre in Los Angeles, Feb. 26, 2018.